Low pressure drop + highly effective cooling=high performance! The APR system increases frontal surface area by 165.09% and has a 124.31% larger core! Internally APR conducted a multitude of tests both on the street and on the dyno with thermocouples and pressure transducers placed at the inlet and outlet of the intercooler during the design phase. Data from these testes were used to chose the intercooler core available today. 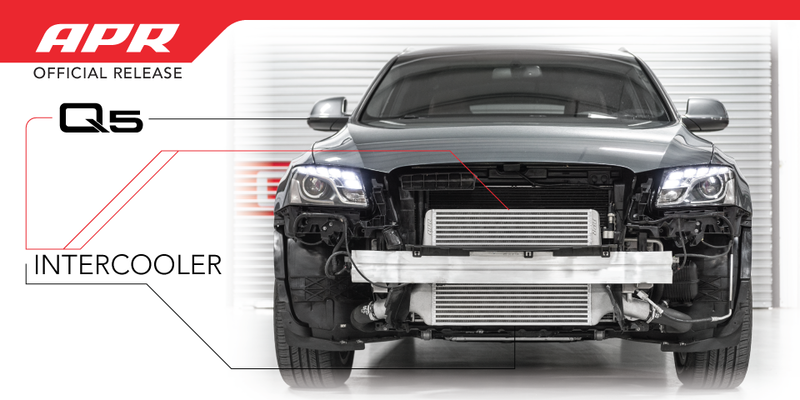 With the intercooler in it’s final production form, tests were conducted against the factory to measure the effectiveness of each system. Testing conducted on the dyno provided a semi controlled environment for back-to-back stress testing the two systems. Utilizing a B8 A4 2.0T 6MT at APR Stage II power levels, six back-to-back twelve second dyno pulls were conducted with only 5 seconds of cool down times between runs. APR’s ECU Explorer high resolution datalogging system was used for raw sensor data collection. 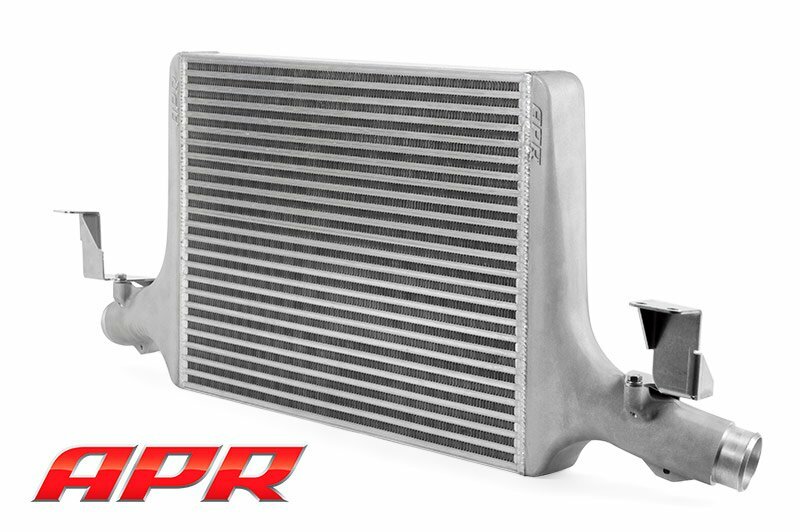 The APR intercooler saw a beginning IAT of 29.25 °C that quickly dropped to 25.50 °C by the end of the first run and settled at only 34.50 °C by the end of the sixth run. The system effectively rejected heat soak and produced consistent dyno results. In stark contrast, the factory intercooler system did far worse. With a cooler beginning IAT of 27 °C, temperature rose to a staggering 42.5 °C after only the first run, already resulting in a poorer IAT than the APR intercooler after six back-to-back runs! As testing continued, it was clear the factory intercooler system was not built with performance in mind. IAT’s continued to rise, ending at 57.75 °C; an additional 23.25 °C higher than the APR system! This translated to a final gain of 17 AWHP over the factory intercooler by the sixth run while the power only varied by under 3 AWHP across all six runs with the APR Intercooler. Does not fit vehicles with the extra Audi Drive Select cooler above the factory crash bar.